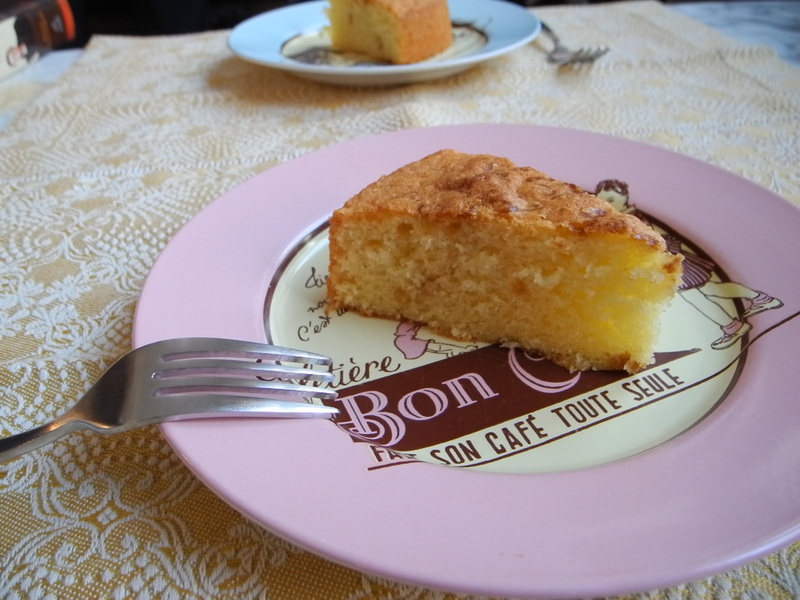 This week’s French Fridays with Dorie recipe, Quatre-Quarts is what we americans know as pound cake. Quatre-Quarts actually means four-fourths, because the cake is traditionally made with equal measures of eggs, flour, sugar, and butter. Dorie of course jazzes her cake up with a few additions, including vanilla extract. Which reminded me that we americans throw vanilla extract into almost every dessert we make, while the europeans use it much more sparingly. Since moving to Germany I have often wondered about this. When I first moved, each trip back to the US was equal parts family visit and supply run. My suitcases on the return trip would be loaded with all the goodies which I can’t buy here. Almost 5 years later I have mostly learned to live without these supplies, but vanilla extract remains one of the few items that I routinely buy when I am in the US. The german supermarkets sometimes carry vanilla extract, but it seems to be more of a seasonal item which pops up around Christmas, and I have yet to see a single german recipe which calls for it. Much more common is vanilla sugar, which comes in little individual paper packets and gets thrown into some cake recipes. Sorry if I’m boring you here. I just find it fascinating how so many of the basic ingredients which we take for granted are used (or not) in different corners of the world. I will offer one quick little warning though. 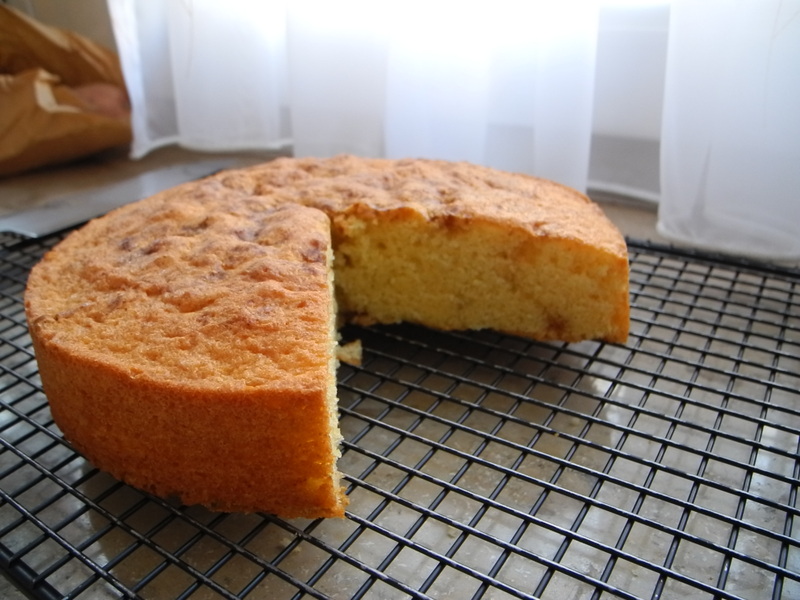 When I first tried this cake, about an hour after it came out of the oven, I found it to be a little too eggy tasting. However, after letting the cake sit and think about itself for a few hours more, the flavors had settled in and my next slice was delicious. Hmmm… I didn’t taste the “eggy” flavour – but I made mine in a much much smaller quantity. I had to stop myself from eating it all right out of the oven! And that’s fascinating about the vanilla extract – who would have thought?? This was a good cake, wasn’t it? Surprising, no? I consider vanilla extract to be a pantry staple. Though, maybe one of these days I need to try substituting vanilla sugar and seeing if I notice a difference. Vanilla seems like such a basic ingredient, I would have thought you could buy it anywhere. Funny how we take things for granted. Your cake came out lovely! By the way…I have some of those vanilla sugar packets here from Dr. Oetker! The Germans are wonderful bakers…I also have one of his cookbooks on baking! Have a great weekend! That’s funny, I didn’t know that you could buy Dr. Oetker products in the US. The Germans are wonderful bakers and they take their cake VERY seriously, in fact, every Sunday afternoon is pretty much dedicated to it. Rosa, You can pretty much get anything on ebay or amazon! I wanted you to know that I have chosen to pass on the Liebster Blog Award to your blog. You can pick it up on my blog. Have a great week! 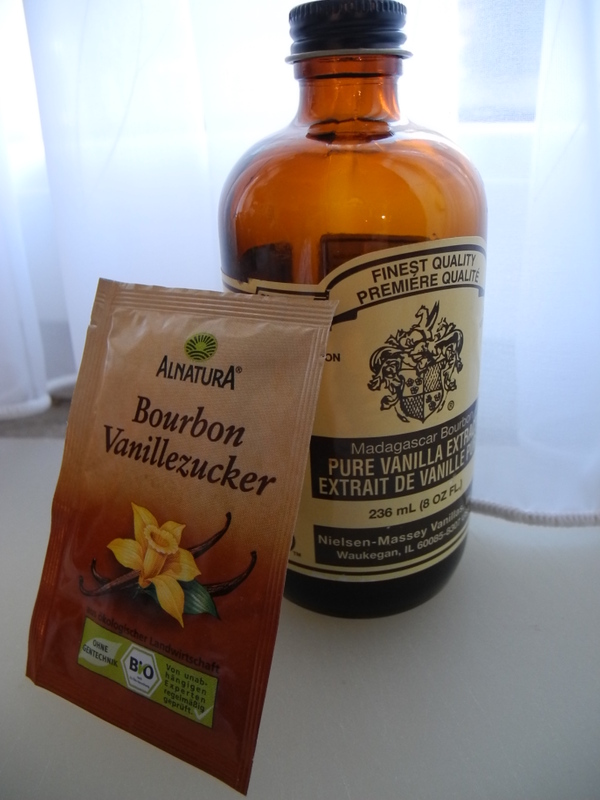 What an interesting post – I would never have known vanilla extract would be hard to find outside of the US. It’s so funny that it would be thought of as a seasonal item, I feel like I use mine a couple of times a week (although maybe that says more about me…). I posted today about a king cake I made earlier this month, and before I gathered the original recipe and my notes, I found myself trying to recap the ingredients in my head. Not surprisingly, I assumed that the cake had vanilla in it. Turns out the cake itself didn’t, but the glaze did! Your point on the pervasiveness of vanilla in American baked goods is spot-on. I’ll never take it for granted! King Cake is French right? I’m not that surprised because I don’t think that the french use vanilla extract as much as we do either. Your cake looks perfect. And you are right, before being assigned this recipe, I had never thought to bake it…too plain and simple, but my mind has changed. And vanilla…I use it by the gallons! I go to the Mexican store only 3 miles from my home and get good, cheap Mexican vanilla, which we really like, and it seems to go into everything, including vanilla cokes. Can’t imagine baking without it. Exactly! And that’s the other problem with trying to buy vanilla extract here in Germany, it comes in these teeny tiny little jars which would last me all of two recipes. I think there might be around 2 tablespoons in there, not more. Just an FYI, the Make the Bread, Buy the Butter book has a recipe for making your own vanilla extract. It goes a little something like stick a bunch of vanilla beans (like 10, I think) in vodka and let it sit for 3 months. It also turned me on to the fact that if you buy vanilla beans in larger quantities (12+) on Amazon, the whole bunch is the same price as one vanilla bean at the supermarket. I checked. It’s true. Your cake looks great! I’m starting to think my pan was the wrong size, b/c my cake was much flatter than everyone else’s. I have heard that one can make vanilla extract, and one of these days when it has been too long between trips I may have to give it a try. But for now, I have managed to wean myself off of so many of my US necessities that I am hanging on to this one. That’s funny. I had never baked with vanilla sugar before moving here and now I too use it regularly. But, for now anyway, I only use it when I am following a german recipe. That’s sweet. My family sent me Vermont maple syrup in the mail for Christmas. I’ll have to try and wait to try this cake again. My friend and I pretty much devoured it on sight once it came out of the oven! Great post! I love your observation about vanilla extract in Europe. It does seem to be very prevalent in everything we bake in North American style baking. Perhaps there is a stronger emphasis on sweet spices in Europe? Lovely cake BTW and I see what you mean about the eggy taste. I feel the same way about vanilla extract, but since baking along with Dorie and the rest of you I have found myself using Dorie’s other suggestions in place of vanilla. Finally broadening my horizons in baking! Having said this though, I really do appreciate that we have vanilla extract, good vanilla extract, so readily available here. Your quatre-quarts looks perfect. I had no idea that vanilla was used so sparingly in other countries. I’m definitely guilty of throwing it into everything. I need to learn to appreciate baked goods with it. Me neither. I always assumed that American use of vanilla came from European roots. I am enjoying substituting rum and brandy when Dorie suggests it. Your cake rose so beautifully high! Like you, I can’t wait to make it again. So good. I was quite surprised by this one as well. When I moved over here there were a few things which I expected to have trouble finding and this was definitely not one of them. I am with you – this cake is simply gorgeous on its own. We loved this one! I’m anxious to try it with different flavors, too.- lemon & orange zest, and different liqueurs. I couldn’t live without vanilla! One of my friends from high school owns one home in Italy & one in NYC. She has to take Dill seeds to Italy to plant there because she can’t find it there. You’re right, we do tend to take a lot of things for granted. No dill in Italy, I never would have thought. I’m endlessly fascinated by this topic. how interesting that it was eggy tasting? ?… I totally know what you mean! I have some access to American ingredients but if I was completely dependent on the UK markets to find all my ingredients, I would be at a loss for some of them! 🙂 What other things do you have to stock up on while your “home’? Beautiful cake. Another blogger commented that the taste was too eggy right out of the oven. interesting. Your plates are really cute – great way to showcase the cake. I never thought about vanilla not being readily available – are vanilla beans? I really enjoying hearing about your experiences – who knew you couldn’t pick up vanilla anytime you wanted. Hope you have a great week! Yes, vanilla beans are available in every grocery store, and just like in the US, they are darn pricey. So interesting! Your information about vanilla led me to do a Google search. Vanilla is a tropical orchid that grows 20 degrees north and south of the Equator. Patricia Rains authored the book Vanilla:The Cultural History of the World’s Favorite Flavor that details the history of vanilla,. Fascinating. A good friend brought me some vanilla extract from Haiti which was much stronger than what we buy at the grocery. Oh, I wish I had some more. It’s not just Europe. I’m from Canada, and there are things that I always have my dad bring when he comes to visit. There’s a particular brand of margarine that I can’t live without! Funny, it’s always something isn’t it. I think even moving between cities in the same country can lead to ingredient problems. I grew up in Vermont and went to college in central Illinois, and couldn’t figure out why fake maple syrup showed up on the table whenever I went out for breakfast! Your cake turned out beautiful! It is very interesting about the use of vanilla in Europe, I had never thought about it, but we Americans due tend to put it in everything! Interesting about the vanilla – I definitely take it for granted! And I thought I had it rough moving from “foodie” Seattle to Reno where it is harder to find specialty ingredients. This was a great cake! That is really interesting that different ingredients are not always available everywhere. I ended up having to buy a giant bottle of vanilla from Sam’s club since I kept running out. You cake looks delicious! I agree, its interesting the little differences in supermarkets and ingredients around the world. A friend of mine in Lithuania couldn’t get cream cheese until recently. Globalization seems to be making us more homogenous. Is that a good thing? I don’t know. Anyhow, you’re cake looks delicious! You’re photos are always so good. I have no problems with the fact that it is now easier to find ingredients from all over the world in my local supermarket, however, I would be sad to see local products disappear. So as long as globalization means adding and not subtracting from my supermarket shelves, I’m all for it. Thanks! I love catching up with you each week as well. I think the fact that we have such a nice group on FFwD is what makes it so much fun.